As a small business, you may not need a lot of IT support -- and hiring a full- or part-time employee to handle your IT services may be outside of your operating budget. But when you do need IT support, you need it immediately. Unfortunately, the last minute is not the best time to find a quality outsourced IT service provider. Brings IT best practices to your business. Has broad and deep IT expertise. Eliminates the learning curve associated with new technology. Outsourced IT doesn't have to mean offshore. Put your IT support services in the hands of the best local IT solutions provider: Advanced Network Products. Working with us offers significant cost savings -- instead of taxing your existing budget, we bear the burden of evaluating and implementing new technology. 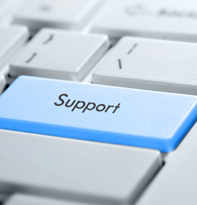 IT Support -- Experienced IT support technicians are at your disposal whenever you need them. Flexible Service Options -- Pay only for the IT services you need, when you need them. Fast Response Times -- Get back to business as quickly as possible with reliable, high-quality IT support that’s only a phone call away. Need on-demand IT support services?